A new augmented reality shopping platform for Xbox Kinect will allow users to try on clothes in true 3-D, share photos with friends, and store wish-listed items on smartphones for shopping on-the-go. Virtual reality shopping just got a lot more real–and could soon become a lot more mainstream. “KinectShop” (working title), an augmented reality shopping platform for the Xbox Kinect, exploits the system’s new finger-recognition technology to allow shoppers to grab items from an unlimited shelf of clothes, see how accessories look at multiple angles, and share the photos with friends on Twitter and Facebook for a quick thumbs-up or down. We’ll soon see just how real the augmented reality is, but in the video demo below, the woman using KinectShop looks just like someone trying on clothes in front of a department store mirror, spinning and shifting her body in the familiar fashion poses. Microsoft’s Kinect has been the fastest-selling consumer electronic device in history, has over 10 million owners, and connects nearly 35 million users through Xbox Live–all of whom are capable of online sharing. “This type of experience is really an untapped market because these devices already live at home,” says Dawson. 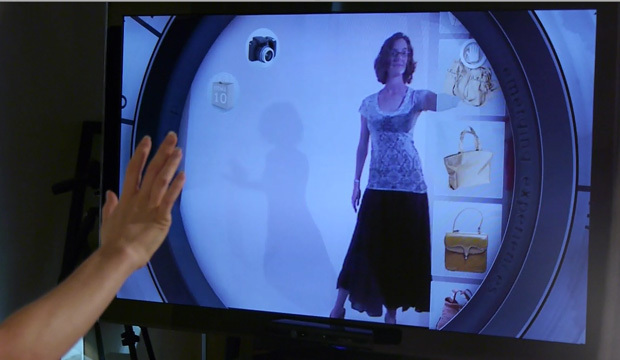 KinectShop is primed to seamlessly integrate with real-life shopping experiences. “With an experience like KinectShop, a shopper can easily scan a QR code or swipe their NFC smartphone to take their experience with them and use wayfinding tools to locate the product in-store,” Luke Hamilton, Dawson’s Razorfish colleague, writes to Fast Company in an email. A smartphone’s ability to activate apps and alert nearby stores to wish-listed items could automate the time-honored skill of deal-finding, too. Imagine digitally trying on a new purse, getting a round of likes on Facebook, and then being alerted to a big sale at a nearby store while running errands–futuristic shopping, indeed. The preliminary version that we demoed was a clean experience for simple gestures but still a little buggy: Rotating an open hand to the side activated the grasping command; the algorithm is meant to recognize an open hand by recognizing the negative space between fingers. The final version aims to allow for richer motions, and, in the near future, Kinect is expect to allow single-finger drawing (as was demoed at E3). So, while we’re not quite up to the evolutionary pinnacle of opposable thumb mechanics, we will be able to grab what we like–which is really what shopping is all about.